Microsoft Security Essentials Alert is the PUP that uses misleading techniques to prevent removal. Use Reimage to locate malicious components and get rid of them faster than with uninstall instructions. A full system scan blocks virus reappearance and prevents traffic to malicious domains. Microsoft Security Essentials Alert (otherwise known as Hicurdismos) is a tech support scam that is triggered by a malicious executable running in system's background. 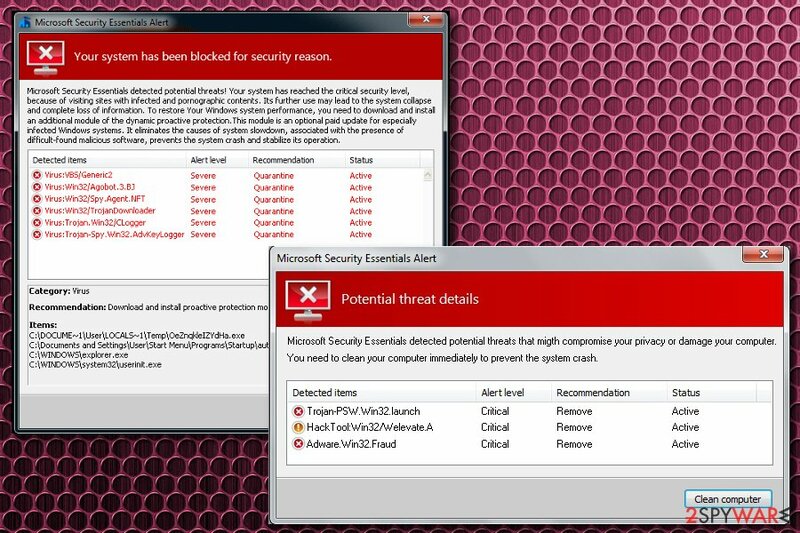 This executable is used to mislead its victim by causing a fake warning message claiming that he or she needs to install Microsoft Security Essentials. If you have been suffering from this alert for some time, you should take into account that it can also be caused by an adware-type program which has to be removed before it causes more havoc on your PC system. Fake BSoD, fake messages, fake scan results, etc. Software bundling, malicious or hacked websites, etc. The main fact, showing that you are dealing with the Microsoft Security Essentials virus or Hicurdismos, is that it has already been replaced by Windows Defender in Windows 8 and 10. Thus, there is no need to install it. Nevertheless, crooks typically use social engineering techniques to convince users that the install is necessary. 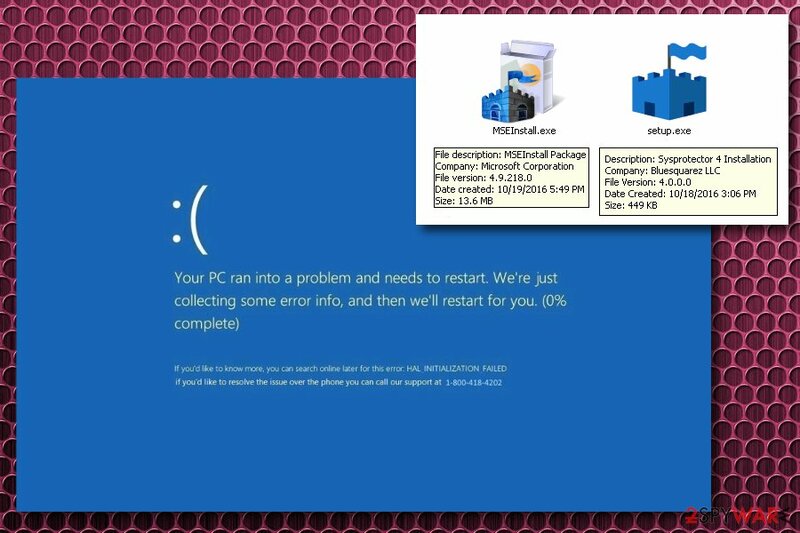 The BSoD covers the whole screen and prevents users from operating their machines properly. Staying calm is vital because Microsoft would never ask its users to contact them via the phone. Interestingly enough, the virus targets Windows 8 and Windows 10 operating systems, no matter that Microsoft Security Essentials was initially released for Windows 7 and some earlier OS versions. Please, keep in mind that the later versions are equipped with Windows Defender by default, so you do not need to download it's earlier nor the later versions! If you are dealign with Microsoft Security Essentials scam, do not contact cybercriminals as you might end up with losing your money or getting your personal data stolen. Instead, proceed with Microsoft Security Essentials Alert removal using Reimage – it will help you eliminate adware and malware automatically. You can also run into a similar tech support scam, which is related to MSE. It is known as Microsoft Security Essential Alert and is caused by adware. This type of tech support scam tries to convince its users that their machines are infected with malware. In reality, your PC is not infected with Trojan-PSW.Win32.launch or similar virus. The main virus, which is hiding in the system, is adware. These ad-supported programs are usually not harmful on their own, as they do not damage systems directly. However, they might trigger false messages that may lead victims to money loss or malware infections. Thus, it is essential to remove Microsoft Security Essentials Alert virus before it is too late. Your system has been blocked for security reason. Microsoft Security Essentials detected potential threats! Your system has reached the critical security level, because of visiting sites with infected and pornographic contents. Its further use may lead to the system collapse and complete loss of information. To restore Your Windows system performance, you need to download and install an additional module of the dynamic proactive protection. This module is an optional paid update for especially infected Windows systems. It eliminates the causes of system slowdown, associated with the presence of difficult-found malicious software, prevents the system crash and stabilizes its operation. It is essential not to panic and realize that the error message is fake. Microsoft would never ask users to download additional software which they need to pay for in such a way. Remember that MSE is dedicated to Windows 7 and earlier, so if you run Windows 10, you would have Windows Defender installed by default. Nevertheless, real anti-malware programs would not ask you for additional payment for removal of certain viruses. Microsoft Securoty Essentials is a fake anti-virus program that (again) tries to make users believe that malware heavily damaged their computers. It is the latest addition to Microsoft Security Essentials Alert which is trying to lurk the world by using a well known name. The executable file which is responsible for its infiltration is called MadarchodLocker.exe. The primary goal of the virus is to make victims download bogus software which allegedly can fix the “damaged” PC. To achieve that, Microsoft Securoty Essentials virus informs users that their system is so severely broken that Windows Defender download is impossible. In some cases, users are prompted to visit rogue websites that might be infected with malware. Note that the fake Microsoft Securoty Essentials might block legitimate anti-malware program from starting properly. To avoid that, reboot your PC in Safe Mode with Networking and launch security software from there. We explain how to execute the procedure below this article. As we have already mentioned, these fake alerts can be caused by installing either malware or adware on your computer. 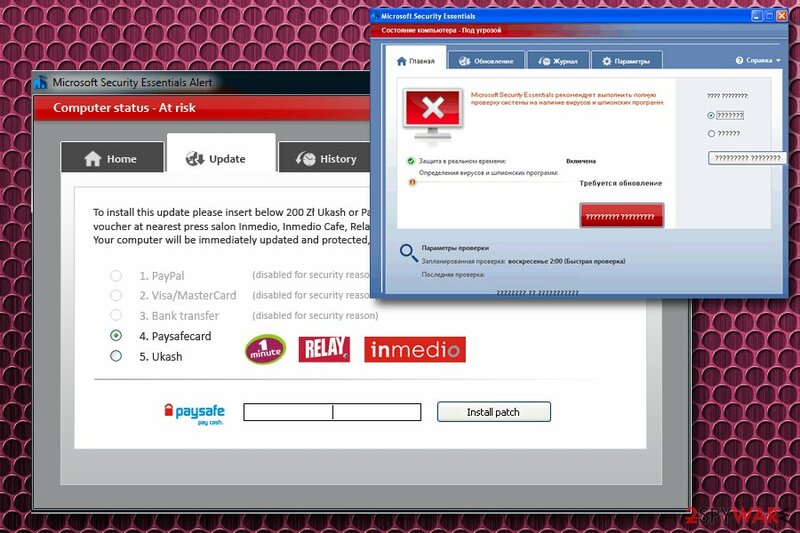 While adware is a relatively harmless software that is created to generate adverts, malicious programs, such as Hicurdismos, can initiate serious havoc. Therefore, security researchers note that it is crucial to learn how to prevent PUPs and viruses before they infiltrate the system. Be careful with emails from unknown sources and never download attachments without checking its sender. Security blogs, websites, and forums offer numerous recommendations on Microsoft Security Essentials Alert removal, so it may sometimes be difficult to distinguish one method that is truly effective. Naturally, there are two virus removal approaches – manual and the automatic one. The manual removal method is a long process that might result in the loss of files or even damage to the system if not carried out carefully. Apart from that, it is quite an effective way to remove Microsoft Security Essentials Alert virus from an infected PC. Nevertheless, you can simply run a full system scan with reliable anti-spyware and bypass all the previously mentioned manual removal risks. Anti-malware utilities will remove the threat automatically. If you can't launch these applications, reboot your system into safe mode with networking first. Here, look for Microsoft Security Essentials Alert or any other recently installed suspicious programs. Wait until you see Applications folder and look for Microsoft Security Essentials Alert or any other suspicious programs on it. Now right click on every of such entries and select Move to Trash. When in the new window, check Delete personal settings and select Reset again to complete Microsoft Security Essentials Alert removal. Once these steps are finished, Microsoft Security Essentials Alert should be removed from your Microsoft Edge browser. Here, select Microsoft Security Essentials Alert and other questionable plugins. Click Remove to delete these entries. Now you will see Reset Firefox to its default state message with Reset Firefox button. Click this button for several times and complete Microsoft Security Essentials Alert removal. Here, select Microsoft Security Essentials Alert and other malicious plugins and select trash icon to delete these entries. Click Reset to confirm this action and complete Microsoft Security Essentials Alert removal. Here, select Extensions and look for Microsoft Security Essentials Alert or other suspicious entries. Click on the Uninstall button to get rid each of them. Now you will see a detailed dialog window filled with reset options. All of those options are usually checked, but you can specify which of them you want to reset. Click the Reset button to complete Microsoft Security Essentials Alert removal process. ^ Tech Support Scams. Federal Trade Commission. Consumer Information. ^ Adware. Technopedia. A site that teaches about technology. ^ What is Windows Defender?. Microsoft. Official website. ^ Blue Screen of Death. Wikipedia. The free encyclopedia. ^ Personal Information. Privacy Sense. Free privacy resources. ^ Bedynet. Bedynet. Russian cybersecurity news and articles. This entry was posted on 2018-04-18 at 04:37 and is filed under Adware, Viruses. You can quickly scan the QR code with your mobile device and have Microsoft Security Essentials Alert virus manual removal instructions right in your pocket. How did you remove Microsoft Security Essentials Alert virus?